Kezia Dugdale has called for a "new Act of Union" in a bid to "save the UK for generations to come". The Scottish Labour leader outlined her plan for a "federal solution" for the UK in a speech to the Institute for Public Policy Research in London. It would see extra powers for English regions as well as Holyrood via a "People's Convention" for the UK. The SNP said Labour had been promising "federalism max" for years but had "consistently failed" to deliver. Ms Dugdale tasked former UK justice secretary Lord Falconer with exploring a federalist approach following the UK's vote to leave the EU in June. Her deputy Alex Rowley has called for Scotland to "move beyond narrow unionism and nationalism" and wants Scottish Labour to campaign for "home rule within a confederal United Kingdom". Ms Dugdale has now set out her own position, saying she is "not embarrassed" to have fought for the UK in the 2014 referendum. She said: "We are now faced with a Tory government in Westminster which looks set to force hard Brexit on the whole of the UK. And an SNP government at Holyrood which wants to exploit the divisions to win independence. "This is the position that the majority of Scots - the moderate, pro-union Scots and also many former Yes voters - find themselves in. "More than ever, we have two governing parties in Scotland that are out of step with what the majority of people in Scotland want. The Tories want Scotland in the UK and out of Europe, and the SNP want Scotland in the EU, but out of the UK. "Continuing to pull our country in each of these directions risks breaking the union once and for all." Ms Dugdale pointed out that the 1707 Act of Union still underpins the relationship between Scotland and the rest of the UK, arguing that there should be a new act "for this new century". She said: "The time has come for the rest of the UK to follow where Scotland led in the 1980s and 1990s and establish a People's Constitutional Convention to re-establish the UK for a new age. "I would not want the convention to just deliberate and report, but to produce a new Act of Union which would reaffirm the partnership between our nations and renew it for the future. After more than 300 years, it is time for a new Act of Union to safeguard our family of nations for generations to come." SNP MSP Linda Fabiani, who sat on the Smith Commission on further powers for Scotland, said Labour were "singing the same old song". She said: "Labour have been promising a supercharged, powerhouse, federalism-max for years - and consistently failing to deliver it. "In fact it was Labour politicians that specifically blocked the powers over the minimum wage they are now asking for. This is just the latest version of the same old song. "Billions of years from now I half expect Labour politicians to be staring into the dying sun calling for a constitutional convention." Senior Scottish Tory MSP Murdo Fraser has spoken in favour of a federal UK with a written constitution. However his party backs the current constitutional settlement, with party chief whip John Lamont accusing Labour of targeting "even more constitutional upheaval". He added: "Surely 10 years of SNP government obsessing over the constitution has taught us that this is the wrong priority. "Like everything we see with Labour right now, it is a complete mess. It is little wonder that nobody has a clue what they stand for." Green co-convener Patrick Harvie said Labour was using "valuable time to discuss changes in the UK constitution which seem vanishingly unlikely to happen, instead of the very real and urgent threat posed by Brexit". 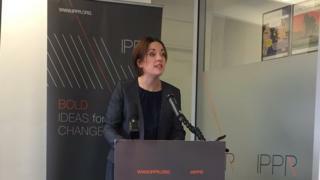 The Liberal Democrats are long-standing supporters of federalism, with Scottish leader Willie Rennie saying it was "good to see momentum building for this" after Ms Dugdale's speech. He added: "Federalism is Scotland's and the United Kingdom's best chance to flourish."